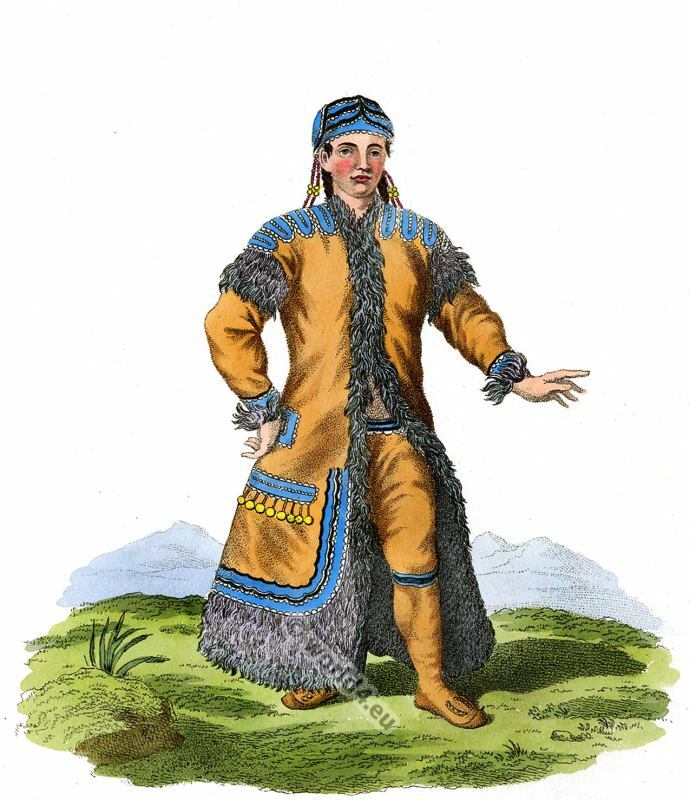 Home » A Female Yakut in traditional folk dress 1803. THE dress of the Yakutan women resembles that of the man; but, in general, their garments are better worked, and more loaded with ornaments. When they wish to appear in their best attire, they throw over their usual dress a waistcoat without sleeves, about six inches shorter than their under garment. This waistcoat is either of skin or fine cloth : the borders are decorated with fringe made of horse-hair, white or coloured ; and the scams are ornamented with elegant embroidery in red and blue stripes, covered with glass beads and coral. The married women are distinguished by their head-dress, which consists of a bonnet made of skin, taken from the heads of different quadrupeds: the ears of the animal ate left standing, and have the appearance of horns. The unmarried women divide the hair into a variety of braids, and wear large fillets round their head, made of skin, and covered wish embroidery and pearls of coral. Small rows of glass beads are fastened to the right and left of this fillet: another fillet, about eighteen inches long, and four broad, passes over the crown of the head, and descends down the hack; this last-mentioned ornament is also loaded with embroidery amid glass beads. The dress of the Yakuti nearly approaches that of the Tongusians. Of all the nations inhabiting these regions, the Yakuti and the Tongusians clothe themselves in the neatest and most elegant manner. The Yakutan women make their own apparel, instead of purchasing them ready made, as is the custom with all the other nations of Siberia: for this reason the attire of the Yakutan girls is particularly shewy, and made with much pains and attention. The Yakutan women are lively and industrious: they discover more activity and courage than the men. Some of them would he sufficiently handsome, were it not for the filthiness of their complexion, arising, principally, from their habit of smoking.